Antibiotic-free meat at Chick-fil-A: Customers have more power than the FDA. Will consumers accomplish what the FDA has not? Chick-fil-A’s market research showed that 70 percent of customers surveyed thought about antibiotics usage and wondered whether it’s necessary. The move was lauded by advocacy groups such as Keep Antibiotics Working and the Natural Resources Defense Council that pressure, cajole, shame, and sue the U.S. Food and Drug Administration over its failure to regulate the practice of dosing food animals with antibiotics. A long list of scientific and health organizations, including the World Health Organization, the Centers for Disease Control and Prevention, the American Medical Association, and the Union of Concerned Scientists, denounce giving antibiotics to healthy animals. The practice fuels the rise of antibiotic-resistant pathogens. Many of these pathogens can sicken people and, because they evolved to be resistant to common drugs, they are becoming ever harder to treat. Here’s the surprising thing: Chick-fil-A is not changing its business practices for the sake of public health. Chick-fil-A is making the change for business reasons. It’s doing so because that’s what its customers want. 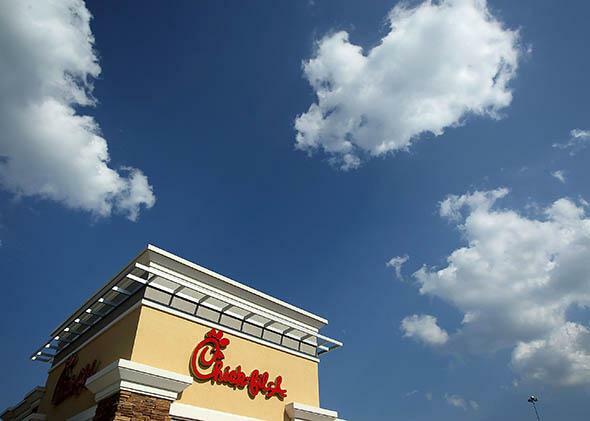 “Our market research showed that 70 percent of Chick-fil-A customers we researched think about antibiotics usage and wonder whether it is necessary,” says company spokeswoman Tiffany Greenway. The last time Chick-fil-A made national news was for homophobic comments: In 2012, COO Dan Cathy told the Baptist Press that the company was “guilty as charged” when it came to not supporting marriage equality and later said that “I think we are inviting God’s judgment on our nation” by legalizing gay marriage. Outrage ensued. Politicians in Boston, Chicago, and San Francisco said they hoped Chick-fil-A would stay away from their cities, and the Muppets ended a promotion deal. In response, conservatives developed a sudden hunger for chicken sandwiches. Former presidential candidate Mike Huckabee called for a “Chick-fil-A Appreciation Day,” which drew long lines of people and led to record sales. If God-fearing, gay-bashing America wants chicken sandwiches without antibiotics, that’s fantastic news. This represents a new level of awareness of the dangers of antibiotic use in agriculture. It suggests that science-based evidence has infiltrated the public awareness. The problem of antibiotic resistance is complicated and multilayered—not to mention dependent on the process of evolution. If the public health message gains such traction that it’s become a concern to customers of a fast-food chain—especially this fast-food chain—then perhaps there is hope after all. Routine antibiotic use has allowed a massive scale-up of livestock production. It allows livestock farmers to pack more animals into a given space without disease running rampant. Also, for reasons no one understands, animals given antibiotics in their food or water grow faster. The payoffs of this agricultural practice are cheap meat and, yes, fast food. The current regulatory landscape can be summed up in one word: voluntary. The FDA has issued voluntary guidelines for the judicious use of antibiotics in farm animals. These “rules” say that antibiotics should not be present in animals’ food or water. They also say antibiotics should not be used to prevent disease, but rather should be restricted to treating sick animals. In other words, the guidelines suggest that antibiotics should be used in animals more like they are in people—only when an individual is ill from an infection that the antibiotics can control. These rules sound good, but there is no oversight and no teeth behind the guidelines. A farmer can still buy antibiotic-laced feed and can still administer low doses to an entire herd of cattle, flock of chickens, or drove of pigs. So can a concentrated animal feeding operation, or CAFO, which treats animals more like industrial widgets, feeding them in close confinement. A large chicken CAFO has 125,000 birds or more. Further, they can dose animals with antibiotics without a veterinarian’s involvement. Drug companies have no incentive to stop selling these drugs—currently 80 percent of all antibiotics sold in the United States are used in animal agriculture. Neither do CAFO owners. They’ve built their “farms” on mass production principles, which rely on antibiotics to grow animals fast and in very close quarters. And yet, almighty consumers can decide they don’t want to eat meat that’s been raised this way. It’s getting easier all the time to buy antibiotic-free meat. Farm collectives such as Niman Ranch and Applegate Farms have strict animal husbandry guidelines that forbid the use of antibiotics in animals that will carry their labels. “We’ve created a network of farmers and slaughterhouses,” says Chris Ely, co-founder and farmer liaison at Applegate Farms, of the more than 1,000 small family farms with whom they partner. If animals do get sick, they are treated with antibiotics and then sold to a different buyer. In many parts of the country, meat from animals raised without antibiotics can be purchased directly from the farmer—at farm stands, farmers markets, community supported agriculture farms, and natural food stores. More and more, supermarket meat coolers contain products labeled “raised without antibiotics,” although there is no standard for what farm practices such phrasings allow. Such chicken may cost more, and with good reason. Animals raised without antibiotics require more living space and often require more labor by the farmer. Think pitchforks, not high-pressure sprayers. You, dear reader, have the power to join public health advocates, foodies, and even Chick-fil-A customers in voting with your food dollars what kind of farm practices you support. Will you?